Hardly a day goes by when there isn’t a good reason for us to rant about the major wireless carriers in the US. Their plans are incredibly expensive and get more confusing every day; they lock you into two-year contracts every time you want to upgrade your phone; they won’t let you tether without doubling your data cost; and all four of them — AT&T, Sprint, T-Mobile, and Verizon — seem to constantly come up with new ways to gain more control and pull more dollar bills from your pocket each month. They even develop services and marketing campaigns designed to scare you away from switching providers. A task that should be easy is complex and confusing. If any of that rings true, you may want to check out Ting. You probably won’t see any flashy billboards advertising it anytime soon, but it might already be our favorite new carrier. It’s developed by Tucows, the same company that’s responsible for Hover.com, which offers domain registration without all the annoying upsells that sites like GoDaddy push on you. The other day I spoke with Michael Goldstein, a marketing manager at Tucows, who enlightened me on Ting, which quietly launched on Feb. 2, 2012. So here’s the big idea. 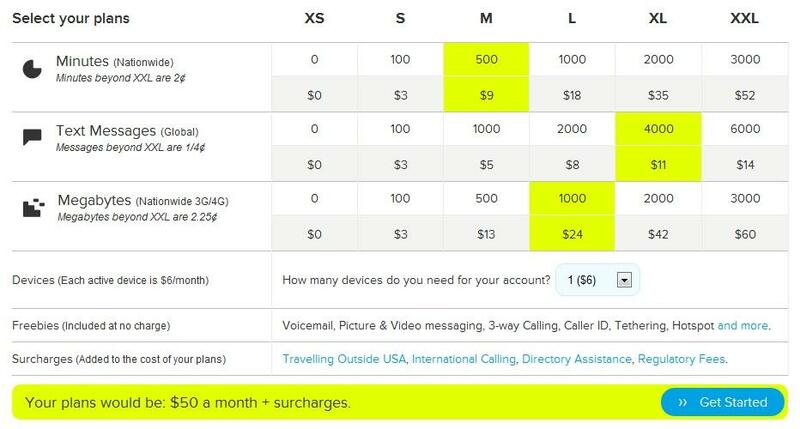 Instead of charging a minimum of $40 for minutes, $20 for texting, and $30 for data, as some carriers do, Ting lets you pay only for the minutes and texts you use. Want 500 minutes a month? That will cost $9. 1000 texts? Add $5 to the bill. 1GB of data bandwidth? That’s $24. (A little high, I know. I’ll get to that.) Add up all these amounts and you get your monthly bill. There’s even a handy Savings Calculator and planning chart on the site that will let you mix and match plans to your heart’s content. If none of this sounds too revolutionary, how about this: Ting actually gives you a refund each month for the minutes, texts, and data that you don’t use. Oh, and if you go over the allotment you set, it simply moves you up to the next bracket, so you’re not stuck with huge overage charges. This feature might be especially good for someone like your parents, who may only use their phone a few times a month, but still get stuck with $50-$100 bills on other carriers. Michael Goldstein said he was surprised Ting is the first wireless carrier to ever try being honest with customers. Features like tethering, mobile hotspots are also included and you can add as many lines as you want ($6 per line) and pool your minutes, texts, and megabytes without having to switch to a different kind of plan (family plan) or anything like that. There is no contract or termination fee either. You can leave at any time. And if you have trouble, Tucow takes customer service pretty seriously. It claims to have “no wait customer service” meaning they will not put you on hold. There are still a few downsides. For starters, since Ting runs off Sprint’s network (it is a MVNO or Mobile Virtual Network Operator like Virgin Mobile and Boost), it is subject to Sprint’s current limitations. This means no 4G LTE (yet), though Sprint does have a 4G WiMax network in some cities and regions. The prices Sprint charges Ting for data is also a bit high, something that Goldstein says they are trying to lower. Currently, they’re charging as little as they can for data and devices. Since there is no contract, you also have to pay almost full price for your phone as well, which means a $500 or so charge, though this practice is common in most countries around the world. The handsets you can use are also limited to select devices that are available on the great yellow carrier. 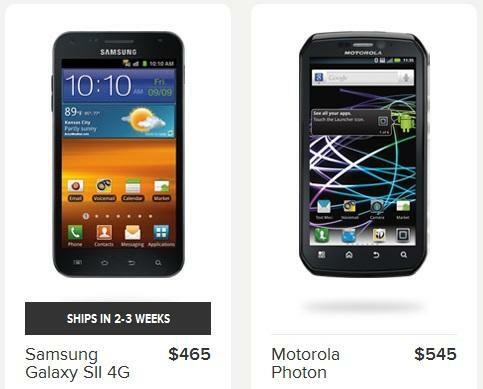 There are some good phones available like the Samsung Galaxy S II and Motorola Photon, but because of silly (evil?) restrictions by carriers, including Sprint, only phones sold by Ting will work on the Ting network. That means that even though Sprint has the iPhone, Ting doesn’t yet have it — something that Goldstein isn’t happy about, though he’s hoping the community will figure out how to get it to work on his network. Goldstein also admitted that they will continue to tinker with plans to make them easier to understand and more fair for users, as they figure out what works and what doesn’t. Ting loves geeks and hackers. In our talk, Goldstein said that even caring about your usage or phone bill is a bit geeky, and Ting is totally fine if it’s service is associated with the tech savvy crowd. For instance, geeks using Ting will quickly figure out that you can easily set every setting to 0 and pay nothing each month except the data that you use. The only reason there are plans at all, I was told, is to help users create a stable monthly budget. Getting a refund each month, it turns out, is more fun than getting a bill that’s too large. The service will be around for a while too. Since Tucows already has a built-up infrastructure to handle Ting’s platform and customer service, thanks to its Hover domain service and its other business selling domain registration software to companies, it’s already making money from the service. Even if it only has 10,000 subscribers, it would not have to shut the service down. Tucows has been in business since 1993. If this article sounds overly positive, it’s only because to all wireless carriers and MVNOs we’ve encountered, honesty and transparency seem to be foreign concepts. To most, it’s all about the Benjamins (quite literally, with today’s prices). Ting responded to, plainly confirming that is neither “evil and/or the spawn of all that is unholy.” Ting might be alone there.